Oh, I had so much fun yesterday at Joanne's house! It was great to catch up with my long lost friend Kari, and to meet Kimberly, Kate, and Angie. Holly was there too, and though we live very close to each other, we don't see each other often, so I was thankful to spend time with her too! Angie's sister Amy was sick and didn't get to join us, and I was sad that Wendy was unable to come too. We missed you guys! Joanne made a most delicious lunch for us, and it was so fun to sit around her table and visit. It's interesting because I met some of those ladies for the first time yesterday, but because I've read their blogs, I felt like I already knew them a little bit. Abbey ended up skipping school to go with me yesterday because there was a glitch with the after-school arrangments I'd made for her. She felt so grown up, and I'm glad she joined us because she was there to take this group photo. Kari is missing because we forgot to take one before she left...sorry Kari! It really was a fun day for all of us! Joanne is so warm and thoughtful! She even made apple pie for dessert because she knows I don't like chocolate. Wasn't that sweet!? Thanks, Joanne, for having all of us over. It was wonderful to be on the receiving end of your hospitality! This morning is my morning to volunteer at my kids' school. I usually enjoy my time there very much, but today I'm really dreading it. I'm dreading it because I need to confront someone. And I don't like confrontation all that much. I coordinate a very big project at my kids' school. I took it on for the first time last year, and made myself, and my family, absolutely crazy...just ask my mom who was here for about 2 weeks and barely saw me! I swore I wouldn't do it again this year, but I actually prayed about it and felt like I was supposed to. And really, the second year is much easier because you've learned what to do and what not to do, and probably my biggest lesson after last year was that I need to delegate. So...delegate I did. And so far it's been pretty smooth sailing. Until last week. I delegated a very important task to someone I probably shouldn't have, and I spent more time than I had last week doing damage control because many mistakes were made. Mistakes are just that--they're mistakes--and they're fixable and forgiveable, but I'm still a little flustered about the whole thing. I've been praying since last week about what I need to say to this person. I want my words to be seasoned with grace and forgiveness, but there are some important things I need to communicate to this person, and I'm not sure how exactly to do that and be heard. So, I think I need some prayer support here. Will you ask God to give me the words to say, the grace with which to speak them, and for them to be received? I would be very grateful! What women in your life inspire/challenge you? I have three that come to mind pretty quickly. One is my friend, Lisa. I met Lisa at my church several years ago, and she and her husband, Steve, are some of our dearest friends. Lisa and Steve lost their son in a tragic accident almost 4 years ago. Lisa is one of the most authentic women I have ever known. And one of the most beautiful--inside and out. She daily grieves the loss of her son, but she has allowed Jesus to come and pick up the pieces of her shattered heart and slowly put them back together. She's pretty honest about her pain. She doesn't understand why this had to happen. She's railed against God (He can take it), but she's found solace in knowing that His heart towards her is good, and that while none of this makes sense, He works all things together for good. Her strength and her steadfast faith inspire me, as does her willingness to not completely close her heart to the pain. Another woman who inspires and challenges me is Sallie. Like Lisa, Sallie is 100% authentic, and what you see is what you get. She is hilariously funny, but also very wise and discerning. Over the last year or so, Sallie has challenged me to let go of the guilt and pressure I *heap* onto myself, and has encouraged me to cut myself some slack (and I'm a slow learner). She has offered extraordinary grace to me on more than one occasion and has really just been a breath of fresh air. And by the way, she's married to our pastor. About two months ago, John and I went to a surprise birthday party for Sallie. Our pastor put the whole thing together (he did great!) and instead of bringing a gift, he asked everyone to come and give Sallie the gift of "sight". We were supposed to write or share some of how we see Sallie that perhaps she can't see about herself. It was a beautiful night. For almost two hours, everyone who was gathered shared aloud how she had touched their life. There wasn't a dry eye in the room either. It was a testimony to the life and light she offers to everyone around her. And lastly, my friend Joan inspires me. I've worked with her for almost three years now at my children's school. She's the librarian, and working in the library is my weekly volunteer job. I love it, and I love her even more! Joan lives a very simple life. She loves her family and her husband. She hikes. She quilts. She reads. She takes classes to learn new things (right now she's learning Spanish). She's active in her church and when she retires this year, she and her husband hope to do some short term missionary work. She's creative. She's down to earth. She's simply amazing! Every week when I leave the library, I feel encouraged as a mom! And I feel encouraged to live more simply and to spend my time and energy on the things that really matter. What books have changed you? One would be The Sacred Romance by Brent Curtis and John Eldredge. This book was truly eye-opening to me. It challenged me to look at my relationship with God as a romance...Him pursuing and romancing me! Imagine that. It also gave me an awareness of how my past hurts (arrows and the message of those arrows) have shaped me, and it created an awareness of spiritual warfare and the role it plays in a believer's life. I went through this book and the study guide about 3 years ago with two very dear friends, and it was a season of transformation for each of us. Another would be Confessions of an Organized Homemaker by Deniece Schofield. I've always been a neat freak, but this book helped me create systems for managing different household tasks (meals, laundry, cleaning, etc). It's helped me make time for the things I enjoy by using the time I do have more efficiently. What is your favorite thing about blogging? Well...I started blogging as a way to journal about our family life, primarily for myself and our immediate family back in Arkansas. I loved that I could post photos and news once and not have to send individual emails to everyone. I still love that, but I also love the bloggy friends I've made. Especially the ones I've gotten to know in real life (irl). 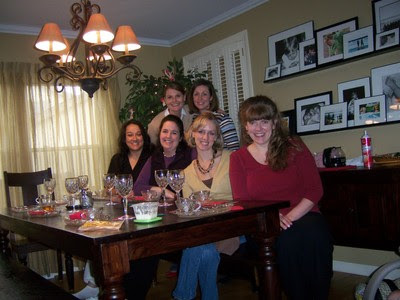 I'm looking forward to getting to meet a few of my bloggy friends irl this spring! Just a few minutes ago, I sat down on my bed to check my email. Our sweet 5-year old walked into my bedroom, then into my bathroom and started brushing her hair and primping in the mirror. She looked up at me after a few minutes and asked, "Mom, do princesses fart?" I really tried not to laugh, but how can you NOT laugh at that? I did what any smart mom would do and answered her question with another question. "Hmmm, sweetie, what do you think?" And she just grinned back at me. I *always* order a tall non-fat chai latte, and if I really wanna splurge, I make it a grande. One of my kids' favorite grown-up friends is coming over in a little while to spend the day with us. She has the day off from work, and my kids have the day off from school, so she's coming over with her beagle, AJ, and we're going to introduce him to Jack and hang out for the day. My kids L-O-V-E Heather. She and her husband babysat for us awhile back, and Abbey asked me later that night as I was tucking her if if Heather and Jesse could be her parents. Every Sunday at church, they each try to be the first to spot Heather, and the minute church is over, they run and attack her with a massive hug. Yep...they love her. And I kinda think she loves them too. One of the (many) reasons my kids love Heather is because she has a dog. A couple times this summer, we had church at the park and Heather and Jesse brought their dogs with them (I love that we had dogs in our worship service). But, being the most unobservant person on the planet, and admittedly, not a dog lover, I didn't realize that AJ was a beagle. And I still didn't realize it when they brought him over when they babysat. It's actually scary how much stuff slips past me. When my kids mobbed Heather and Jesse to tell them about Jack, she reminded me she had a beagle too, and that we needed to have a puppy playdate! So, today's the day. There is much excitement around here in anticipation of their arrival! I'm actually a tad bit nervous about Jack because he seems a little agressive with the dogs in our neighborhood...so we'll see how it goes. I'm thinking I can separate them and send one outside to play in the snow if I need to! Sometime last year, my 10-year-old son decided he loved football. After years of watching (and loving) football by myself, Will's decision to watch (and love) the game was a pleasant surprise. One that made me very, very happy! You should know that Will's teacher is from Wisconsin and is a HUGE Packers fan. Every time the Packers win, she rewards the class with a special treat, usually of the sugary variety. At first, I thought maybe his new-found love of football was so that he could intelligently discuss the game on Monday with his teacher and friends, but nope, he's genuinely interested in it! I LOVE that!! Last Sunday, we were both excited about the playoff games and we made a "date" to come home from church and watch the Colts/Chargers, and then the Cowboys/Giants together. Will decided that we needed some "junk" food to enhance our viewing pleasure, so the two of us made a quick trip to the grocery store and loaded up on chips, soda, and beef jerky (his fave!) then came home and sat together in the recliner and watched some football. We both nearly cried when the Colts lost, and one of us nearly cried later when the Cowboys lost. We've been looking forward all week to the AFC and NFC Championship games, and last night we made plans to have another football date this afternoon. We made a repeat trip to the store to load up on junk food, and came home and have been watching football non-stop. The girls are off having fashion shows with their American Girl dolls, and John has been reading manuscripts in between judging the fashion shows. But Will and I have been cozied up in the recliner, by the nice warm fire, enjoying the last few games of the season! I love sharing moments like this with my son! I love getting to explain some of the game to him, I love seeing him get excited when his team runs the ball toward the end zone, and seeing him get upset when they fumble or throw an interception. I LOVE this game, and hope that Will and I will have many more afternoons like this in our future! Interesingly, these are hiking related questions! How/where do you find the get up and go for hikes in 20 degree weather? Okay…two things here. One, I don’t hike alone. I usually go with 2-3 friends, and if I ever decided to stay inside by my nice, warm fire, they would alternately call my home and cell phone until I answered, or come and drag me out my front door. They don’t let me off the hook easily, cause we're all in this together! And two, if it is 20 degrees outside AND the sun is shining, it rarely feels that cold. The lack of humidity helps too. A damp 20 degrees is way more miserable than a dry, sunny 20 degrees. So yeah, 20 degrees is cold, but not unbearable. It was -5 when I took the kids to school yesterday morning, and it's 10 degrees (and cloudy) right now. Definitely too cold for a hike! I'm sitting by my nice warm fire instead! How long will the Pikes Peak hike take? will you have to camp overnight on your way? Well, there are several routes to the summit of Pikes Peak, and my little posse has decided to hike Barr Trail. It’s a 13 mile trail with a 7,000 ft elevation gain, and will probably take anywhere from 6-8 hours. Halfway up the trail is Barr Camp, where hikers can lodge and re-fuel. We'll re-fuel, but not camp. Our goal is to climb it in one day. I love all the questions you guys have asked! Wow! I can't answer them all in one post, but here's a start. I'll answer them in as many posts as it takes...so stay tuned. When did you first know Jesus/become saved? Well, I grew up in a Christian home, so for as long as I can remember I knew about Jesus—knew who He was, and that He loved me and died for my sins. My parents were/are Catholic believers though, so being “saved” or asking Jesus into my heart was not the lingo in my home. During my 6th/7th grade years, I got really involved with a youth group at my best friend’s (Baptist) church. I went to a Centrifuge camp with her group one summer, and during one of the nightly invitations, she grabbed my hand and led me to the front where I made a decision to trust Christ. For years I was really haunted by that experience because it didn’t seem to be my own. It felt like I was prompted, not only by my friend, but by a healthy fear of hell. Fast forward several years to a church revival service in Fort Worth, Texas. My husband was a seminary student and I knew that one day I would be a pastor's wife, but I doubted that camp experience so much that I didn’t even know if I had really ever trusted Jesus as my Savior. So, I did one night during that revival service. I confessed my fears to those around me, believed Jesus died on the cross for MY sins, and accepted His forgiveness, and began to really walk with Him. Since moving to Colorado four years ago, walking with Jesus has become something more than I ever imagined. This season has been one of the hardest of our lives, but it has also opened up a spaciousness of faith for me. I'd say that my faith these days is characterized by a lot less striving and a lot more rest, and of just letting Him love me. When or How do you connect with Jesus best? Is it through singing, hiking, prayer time? Definitely through nature. I am so awed by the beauty of the mountains and lakes and trees and skies. By the colors and textures and sounds. I immediately feel calm and stilled and clear-headed enough to hear His voice. So…yeah, just being outside or hiking. It doesn’t take much for me to get in a “zone”. Bonus question: Desert Island movie (assuming there is a cable/DVD hook up)? Probably the Sound of Music. I sometimes forget how much I love, love, love that movie. How did you all find yourselves in Colorado? We moved here for John to co-pastor a church with a very good friend of his. Sadly, it wasn’t a good fit for our family, and about a year later, John resigned from that position and was contracted to write some Bible studies for a local publishing company. Thus began a new chapter in our lives and a new career for him. Was it hard to move states away from your family? Absolutely. It’s still hard. And do you have any thoughts of going back to Arkansas? Well, I love our family in Arkansas, but I LOVE Colorado too, and tell God “thank you” every day that we get to live in a place of such beauty. I hope we get to live here for a long time, but if we ever felt like God was leading us to move back to our home state, we would. If that should happen, I’d lobby hard to live in northwest Arkansas where there are mountains hills. Tell us about a "famous encounter" or two or three :) The question: will you tell us? Sure, I'll tell ya! I’ve mentioned already that I went to college with the girls in Point of Grace. And I think I’ve mentioned before that I met Beth Moore once at a Living Proof Live event in Hot Springs, Arkansas. She grew up in Arkadelphia and she invited all the ladies from churches in our little town to a special reception before the event. She was so sweet and funny and genuine. And I just about laughed my head off when she told the lady in line next to me that her son was the first boy she’d ever kissed. I’ve also met Stasi Eldredge, one of the authors of Captivating. And last spring I met Brennan Manning, an author I really love. You know, this would be a really good question to ask my husband…he’s met some really cool people in the publishing world, and a few days ago, he told Will about running into Emmett Smith one time at Baylor Hospital in Dallas. What are the best/worst thing(s) about having a dog? I think the best thing about having a dog is watching my kids love him to death. I love seeing them cozied up together on the sofa or his tail waggin’ like crazy first thing in the morning. I think the worst thing is feeling like I can’t be gone for long periods of time. I put Jack in his kennel when I leave, but the longest I’ve left him is about 4 hours. Are you a Creative Memories consultant? Well, yes, I am. But I’m a poor one. I didn’t get the “sales” gene. Apparently, I do because I was at a birthday party for a friend last night and glanced in the mirror before I left to see that my cheeks and nose are a lovely shade of pink. I just don't have sunscreen on my mind when I'm going for a morning hike and it's well below freezing outside, but perhaps I should start thinking about it. I LOVE the questions you guys sent my way yesterday in my "Your Turn" post. I'm going to try to answer some of them today. Tuesdays are my busy day and I am on the go from morning til afternoon, so it may be tonight before I get them answered....BUT oh the blog fodder I now have. Thank you! It's not too late to leave a question either. My plan is to answer each and every one. One of the things on my to-do list today is to get my haircut! I haven't had a haircut since this. And I'm way overdue for one. I'm so ready and so excited! For three days now I've sat down to blog and instead have stared blankly at the screen. I'm entirely uninspired these days. Entirely uninspired. I considered writing about my hike this morning. It was a great hike, but it was pretty uneventful. Unless you count 20 degree temps and the snow/ice pack. And the fact that I almost slipped and fell twice, and NOT on the ice but on the loose gravel. So, friends, I'm asking you for help. Now's your chance to ask me a question...any question you want. Anything you're just dying to know about my oh so normal life? Leave it in the comments section and I'll do my best to answer! I think this could be fun so ask away! My bloggy friend, Gretchen is hosting a book giveaway on her blog. I wish I'd posted this sooner, but you still have time to go and register for a chance to win some free books. I haven't read all of the titles she's giving away, but they're intriguing! Go here and leave her a comment for your chance to win! But hurry...she's choosing a winner tomorrow morning. And my bloggy friend Trish is hosting a 10-week Winter Reading Challenge...and she's even giving away a $25 Amazon gift certificate! You can read all about that here! One of Trish's friends even listed the books of the Bible she was planning to read. Isn't that smart? Who knows? Maybe you'll win Gretchen's books and get to add them to your list for Trish's reading challenge. It could happen you know. Blogged about the beautiful, fluffy choc. chip cookies! Sliced chicken and made marinade for fajitas (dinner)! And I still need to shower and go get my half-day kindie! John was totally joking when he asked me what I did all day, but it's a lengthy list. He knows I work hard, and he's appreciative of all it takes to keep our home running smoothly. He works hard too, and I'm extremely grateful that he does so that I can be home and make our home a place we all want to be! I wouldn't trade that for anything. Except for maybe a nap. RAOK--or random act of kindness. Have you ever been on the receiving end of one? John and I were this morning. Today was the first day back to school for our children since Christmas. It snowed last night and the roads were nasty, and I was kinda extremely surprised they started on time this morning, but they did. John had already planned to work from home today, and I was very thankful when he told me he'd drive the kids to school because I hate driving on snowy/icy roads. Anyway, I rode with him to take the kids and we made a Starbucks run before heading home because it was 18 degrees and in my estimation a perfect morning for a piping hot latte. My friend happened to pull into the Starbucks drive-thru ahead of us and we had a very animated (yet wordless) conversation through the windows of our vehicles. I'm sure it was amusing to anyone watching us. I was really tempted to go jump in the front seat of her Suburban and chat with her while waiting in the long line of cars, but I rarely have a morning with John so I didn't. When we pulled up to pay for our drinks, the cashier said, "The lady in front of you paid for your drinks and said to tell you 'Happy New Year'." Wasn't that nice? Maybe that's why my latte tasted better than ever. I called her later this morning to tell her thank you. And I told her that I want to return the favor by paying it forward. So now I'm on the lookout for a way(s) that I can bless someone else with a random act of kindness. We love you very much and hope you have a wonderful birthday! I watched the news last night to find out when all the snow west of us was going to come in. Their radar showed clear skies for our area for today and only a chance of flurries for tomorrow. Uh huh. We woke up to 2+ inches of snow and it's still coming down. Now they say we have a 50% chance of precip for the day. Nice. John and I both have what I call "barometer-head". When the weather changes, we usually know it by the dull headache we get. Weird, but true. And I'm so tempted right now to call the weather-girl and tell her I could-have-told-you-snow-was-coming-because-we-both-had-to-take-4-Advil-yesterday. I'm loving today's snow. The snow we had on the ground from previous weeks was a lovely shade of brown because of all the wind-driven dirt and debris we've experienced lately. Now everything is lovely and white again. And that makes me smile. We got back a little while ago from a trip to Target. SuperTarget, actually. The kids still had gift card $$ they were dying to spend (saving isn't really in their vocabulary) and since we haven't been out of the house since New Years' Eve, I thought it might be nice to get out and do something. Target doesn't rank high on my list of things to do (I do not, not, not like to shop), but it ended up being fun. Did I just say that shopping with all three of my children was fun? Oh my. Well, anyway, Target had all their Christmas stuff marked 90% off, and I picked up some bows and boxes for a grand total of .40 My biggest score of the day was a 2pk of flannel pajama pants for Abbey. Originally 14.99 marked down to 1.49. Ummm...I believe we can call that a bargain. And if your children find themselves in need of shoes, you really need to make haste. Huge markdowns in the shoe department! Sarah got a cute pair for 2.48, and Abbey found some for a dollar more. So cute. And they were even willing to spend their own money. Nice. It was such a nice morning to get out and about because the weather here today is lovely. We're pushing 50 degrees, and believe me, after a long stretch of 20s/30s, 50 feels almost tropical. The snow pack that has made our neighborhood streets the equivalent of an ice rink is finally melting, and I actually saw pavement today for the first time since before Christmas. Woohoo! Believe me, the kids and Jack are going to be spending some time outside this afternoon!! Even if it means I'll have to mop up the muddy mess they'll bring inside with them! Guess what? I have 2 (maybe 3) friends that want to climb Pikes Peak with me! One of them has already collected some training info and mapped out a few hikes for us to do in preparation. F-U-N! I am so excited about this. I'm going to meet them for dinner tonight, and I'm guessing it will come up in conversation. Friday nights are usually Family Night for us, but since my kids are home until next Tuesday, and since we've had family night almost every night of Christmas break, I think a Mom's Night Out is in order. I can't wait. So excited too to get to see "J", one of my best friends from high school this weekend. She's in Denver for a few days, and I'm hoping to catch up with her over coffee or a meal! Is anyone else still getting Christmas cards in the mail besides me? I LOVE it. We've gotten several this week, and I think it is so fun going to the mailbox this time of year. I love hearing from friends...near and far...and have loved re-connecting this year with some college friends, high school friends, and some former church friends. I can't bear to throw away all of the photos and cards we get, but we get so many that there is no way I can include them all in a scrapbook without quickly amassing a stack of Christmas scrapbooks. Any ideas on what to do with them? I read on another blog that some people put them in a bowl/basket and choose one each night at dinner and talk about how they know the sender, then pray for that person/family. I like that idea, though we'd have to choose 2/3 each night if we want to finish before Valentines Day! Any other great ideas out there? Or do you just throw them away??? See. Much to say about nothing much at all. Lucky for you, I have to quit rambling and go get lunch ready for my crew. Enjoy the weekend! Oh yeah...we found our 50th state license plate today--the obscure Rhode Island. We started hunting them this summer when John's brother was out visiting, and we've been on the lookout for the last handful for a few months. My kids were so excited to find Rhode Island, and I'm so glad I can finally throw the list-that's-been-in-my-purse-since-July away! We rang in the new year with fun family day. We went to lunch at our favorite mexican place, then took the kids to see a movie. We came home and had a junk food fest, because, you know, there's nothing like ending the year with a caloric bang! After rousing games of Apples to Apples and Yahtzee, we had a High School Musical 2 dance party, then sent the kids off to bed and tried to stay awake until midnight. All that dancing made us tired, but it was SO much fun! We're having a lazy day today. John goes back to work tomorrow (he's been off for 10 days!) but the kids are home with me for the rest of the week. I'm going to enjoy today because my house is clean, my husband and children are at home with me, the Razorbacks are on tv, and my refrigerator is full. It's the little things that make me happy! Life is good, and today I feel deeply content.